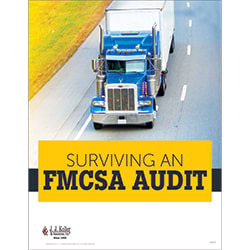 When a motor carrier is notified that the Federal Motor Carrier Safety Administration (FMCSA) is scheduling an investigation or compliance review, also known as an audit, employees and management at the company may be left bewildered on what to expect. This whitepaper offers a glimpse into the auditing process, including the different types of investigations, areas of focus, potential fines, and top auditing violations for 2017. It includes information that can help you survive an audit. Fill out the form to download your FREE DOT Safety Audits whitepaper.